We've always felt sort of conflicted about crudités. On one hand, they're often sort of boring—forlorn rows of carrot sticks, broccoli florets in little piles. 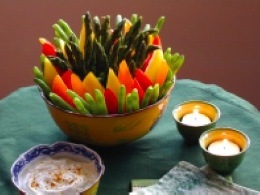 On the other hand, when we serve crudités at parties, they inevitably disappear, which is, of course, the ultimate hors d'oeuvres endorsement. So if the veggie array is here to stay, let's not just sigh and slice another celery stalk. Let's elevate the whole shebang to centerpiece status! Instead of laying our sticks and spears and slices flat on a tray, we display them vertically in a pretty bowl. Place taller items like asparagus spears in the center and surround them with shorter options, alternating colors where possible. A flower arranger's trick: Put a small, shallow dish in the center of the larger bowl to get the innermost bunch to stay upright. From boring to beautiful. Hooray, crudités!